At Avante we work diligently to continue to outpace the industry when in comes to design and production quality. We’re also able to keep your marketing costs down by keeping all aspects of our team in-house. Design is in-house. Print is in-house. And maufacturing is in-house. We remain a leader in slatwall POP display (or slotwall) manufacturing simply by adhering to decades-old company standards of studying how your customers buy and catching their eye. 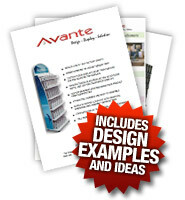 We at Avante work side by side as a professional unit to create solutions to drive your sales. Slatwall POP display units give you versatility for displaying your products. The construction of slatwall displays is a thermo-fused melamine (plastic slatwall is also available). Slatwall allows the point of purchase display to accept hooks, shelves, brackets, bins & signage. Slatwall pop displays can be used when designing a custom counter top, wall or freestanding floor display. So now that we’ve touched on the value of and flexibility of slatwall displays, let’s touch on the more important question of the moment…. in-house Design: We at Avante maintain an industry leading design team that first applies design concepts to work through the sales flow for your potential customer. In-house Print: Our in-house print team is able to take direct orders from our designers and bring to the world the brilliant concepts our designers have offered. In-house Production: With design and print in place, our production team is able to build the display units that maintain the integrity of the concept while fulfilling constructional requirements. Eco-Friendly Materials: We at Avante believe the future can be considered while driving business today. We do our best to use only the most eco friendly materials without compromising the overall design or performance of the display in the slightest. Industry-Leading Performance: These slatwall displays, as do all our displays, simply outperform the displays of our competitors. Perhaps the better question to ask yourself…. Why Consider Any Display Manufacturer other than Avante to trust with your most important product store placements? Team with an industry leader to design custom slatwall POP displays built with your bottom line in mind.